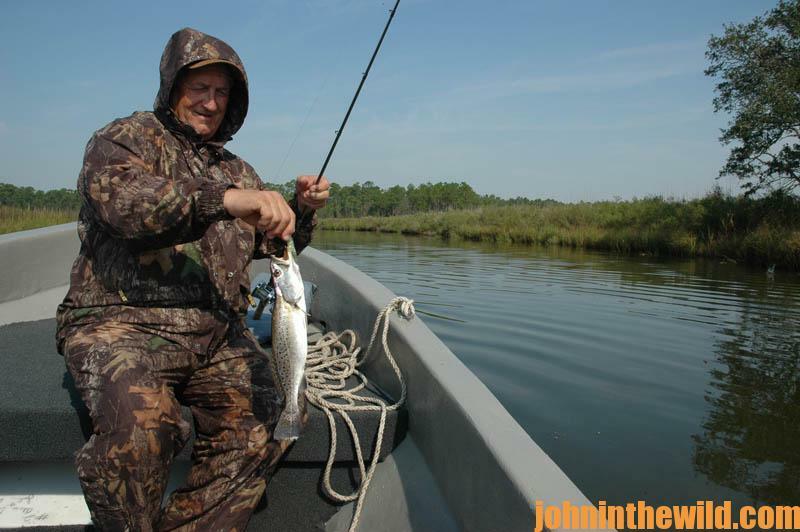 John’s Note: During the fall and winter months, the speckled trout move up the rivers that feed Perdido Bay and Mobile Bay. 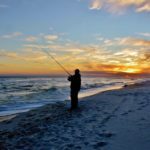 So, when you’re vacationing at Alabama’s Gulf Coast, you have four fishing opportunities by fishing in the Gulf of Mexico, the back bays, Lake Shelby, a freshwater lake at the beach, and the coastal rivers. Captain Gary Davis of Magnolia Spring, Ala., follows the speckled fish and redfish from the Gulf of Mexico to Mobile Bay and up the rivers. 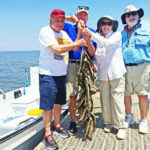 As the speckled trout are moving out of the bay and up the coastal rivers, my fishing clients and I have been doing well and catching a lot of fish there. Any cold snap that occurs will push trout up the coastal rivers and out of Mobile Bay. The trout go up the river when cold weather moves in is because the cold weather forces the bait fish that the trout feed on to start moving up the rivers. The bays on Alabama’s Gulf Coast generally are shallow, and the rivers provide deeper water and warmer water for the bait fish. The speckled trout and redfish are much like hungry dogs behind a meat wagon. The fish are always going to move where their food goes. 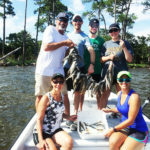 Some of the best river systems to fish are Wolf Creek, the Fish River and just about any river or creek that flows into Perdido or Mobile bays. These trout will be 16 – 18 inches and plenty of them. But actually the bigger trout seem to bite better in these regions in December and January. Now, the big trout will be in the same areas as the smaller trout will be, but they are much harder to catch in October and November because there’s so much bait for them to eat. We usually can catch 10 trout per person every day we go. The rivers also home some good redfish in the fall and winter. To catch the redfish, we use live shrimp and live Lys (alewives) and fish for them like we were fishing for largemouth bass. The redfish will be found anywhere you find structure. But when it comes to fishing for trout, 90% of our fishing is with artificial lures like chartreuse D.O.A. (http://www.doalures.com/) shrimp. Chartreuse and green have proven to be the most-productive colors for me. I like the artificial lures better than live shrimp at this time of year, because they are much easier to fish with and look different from the live bait the fish see every day. I fish both lures on 8-pound-test line. In the early mornings, the speckled trout generally will be holding in holes in the middle of the rivers, and as the day warms up, they’ll move closer to the bank. 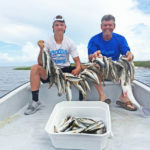 I’ll be fishing for flounder too, and the flounder bite will be good at Fort Morgan and Little Lagoon, as the flounder move out of the estuaries and head to the Gulf of Mexico to spend the winter. We’ll catch flounder on live bull minnows. 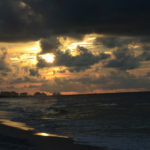 My favorite place to fish is at the mouth of Fort Morgan, and you’ll catch white trout too, while fishing for flounder. We’ll have good fishing usually up until about Christmastime. 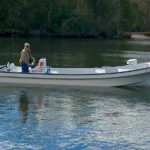 To meet even more of our captains and fishermen before you visit Alabama’s Gulf Coast, visit my YouTube channel. 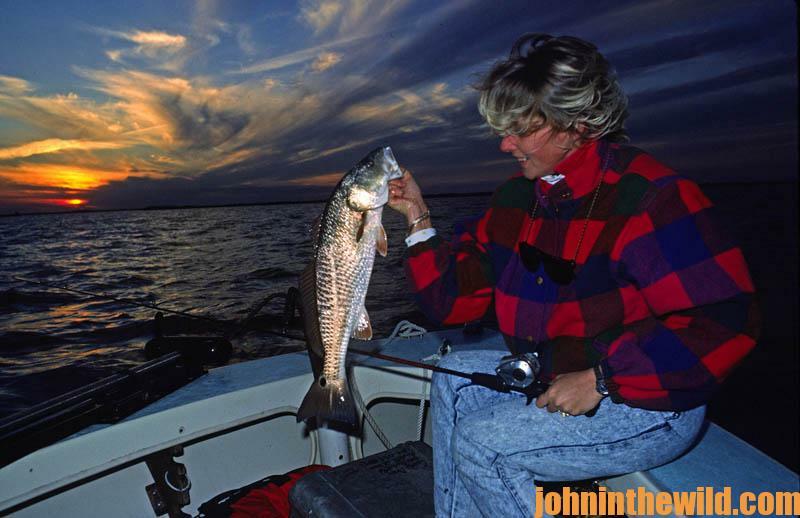 To learn more about inshore fishing, go to https://www.amazon.com/Alabamas-Inshore-Saltwater-Fishing-Year-Round-ebook/dp/B009EZR046/ref=asap_bc?ie=UTF8 for John’s book, “Alabama’s Inshore Saltwater Fishing.” For more information about John E. Phillips’ fishing and hunting books, check out www.amazon.com/author/johnephillips and www.barnesandnoble.com.